Did you know that yesterday was National Chocolate Chip Cookie Day? I need to get myself a calendar and start marking these things down for next year. It just so happens that I had made these little cheesecakes a while ago and never did a post about them because my husband didn’t love them (more about that later). However I thought these would be perfect to share with you this Monday morning. The recipes are simple and the method is easy. I used the classic chocolate chip cookie recipe off of the back of the Nestle Tollhouse chocolate chips bag. I divided the dough into 6 equal portions and baked the cookies in well-greased mini (6 inch) springform pans for about 15 minutes. Let the cookies cool completely. When cooled prepare the no bake cheesecake. I have been using this cheesecake recipe for years so I’m not really sure where it came from. It’s pretty classic, nothing out of the ordinary. Pour your cheesecake over the cooled cookies and refrigerate 5 hours (or overnight). Just before serving sprinkle with mini chocolate chips. As I said, my husband didn’t quite rave over this recipe so I hesitated sharing it with you. But it really is delicious. He’s just more of a fruit guy when it comes to cheesecake. Sometimes you have to agree to disagree, right? I originally made this for my teenage brother. He was a supporter of the recipe from first glance all the way through to the last bite! Enjoy! And happy National Chocolate Chip Cookie Day to you! Beat the cream cheese until smooth, then slowly add the sugar and vanilla (and lemon juice if using). Slowly beat the Cool Whip into the cream cheese mixture. Spoon filling onto cookie crust. Chill for 4-6 hours before serving. I used my favorite Chocolate Chip Cookie recipe as the crust. If substituting whipping cream for Cool Whip you will need 1 cup. In a clean chilled bowl, beat the whipping cream until soft peaks form and replace with step 3. *You CAN make this in a standard springform pan instead of 4 (6 inch) minis. I have not tried this method but other readers have and written to me that it turned out perfectly. You just need to adjust your cookie baking time. I would start with 350° for 20-25 minutes. Cookie and cheesecake is one of my favorite combinations! Your individual cheesecakes look fantastic and I love photo with the chocolate dripping down the sides! This is a perfect recipe for National Chocolate Chip Cookie Day. I am glad you posted it. My husband and I agree to disagree often! Great recipe for National Chocolate Chip Cookie Day, which I didn’t even know about. I like the mini size so cute! I’m glad you posted a cross section of the crust because that looks to be the best part. WOW!!! 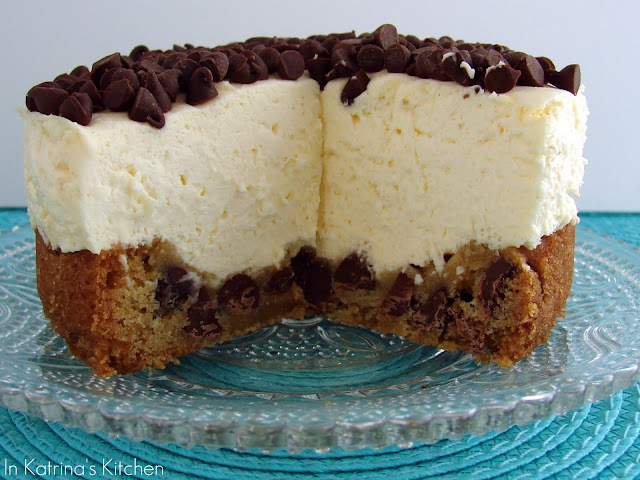 Chocolate chip cookie crust + cheesecake?! I am soooo glad you shared!! This looks fantastic!! This looks incredible! Men, what do they know! “Little” cheesecakes? They look awesome! I know what you mean, I am sometimes hesitant to post recipes that my husband does not favor, but sometimes you just have to go with your gut. These look fantastic, I’m glad you decided to post it! OMG! This looks crazzzzzy delicious! Katrina, this looks incredible! Wowza. That’s my kind of cheesecake! Happy National Chocolate Chip Cookie Day! Chocolate Chip cookies are my absolute top favorite dessert and I’m glad to see they have their own day 🙂 Enjoy your relax time later!! Okay, why, why, why didn’t your husband love these? I can tell from a single glance that I would love these. And I need a calendar with all of these national food days too, I am woefully unaware of them. I wish I would have known about the chocolate chip ce;ebration, but I’d make this anyhow!! Two faves together! 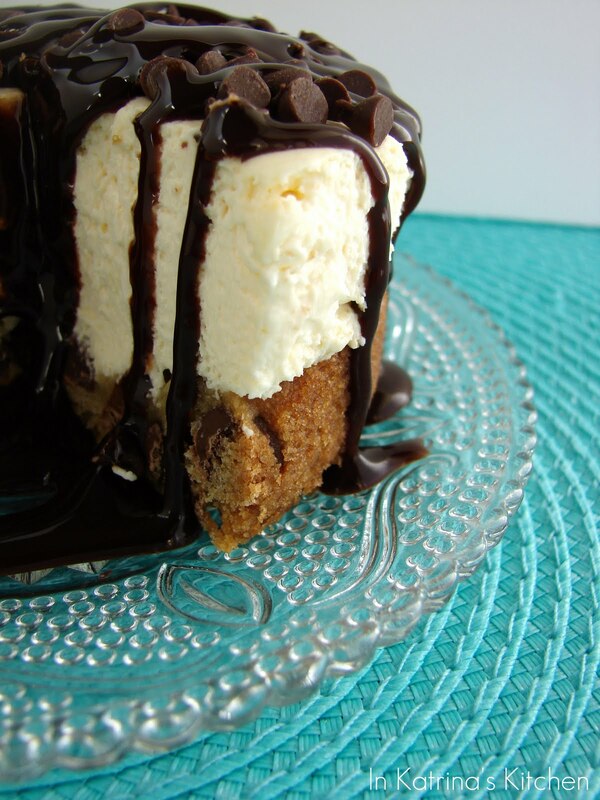 wow….that looks INCREDIBLE….especially with the chocolate sauce! Oh my! I think I would love these…cookies AND cheesecake? Great combo, Katrina!! What are you doing to me Katrina??? Have a amazing Monday sweetie! umm…why didn’t your hubs like this?? cheesecake AND chocolate chip cookies…seems like the ultimate combination! Oh my dear goodness, you could not have possibly caused me to salivate any more than you just did. Beautiful! Delicious! Great photos! Nicely done! Katrina this looks amazing! I love the idea of a cookie crust. How creative! Oh My. I’ve died and gone to heaven looking at these pictures. I need this now! I can’t believe how awesome this looks and then you come to the ingredient list and there are only four items, awesome! My husband loves cheesecake and he will be enjoying this very soon! I’d be a supporter of this too, especially with that extra drizzle of chocolate! I certainly wouldn’t complain about a cookie cheesecake! I think this looks divine! The best of all worlds! And easy? I’m in! I’m guessing your hubby doesn’t like eating raw cookie dough either, or licking frosting shots out of a little cup. Oh well, at least you get to eat more of your choc chip cookie cheesecake all to yourself. *knock knock* Did somebody call for more of me in their life? Well, baby…you make this cheese cake and i will be beating down your door, for sure. Are you freaking kidding me. I will make this and I will get fat and I will love it. I need it in my belly….now. 😉 Fabulous post. Wonderful recipe. Fantastic job, as per usual, chica. this looks so lovely and very sinful! :) thank you for sharing this post with us and have a great day. That looks very, very appetizing! I am not a huge chocolate fan, but my husband would LOVE a slice (or two) of that… 🙂 Thanks for sharing! Oh man!! That is a serious cheesecake right there! 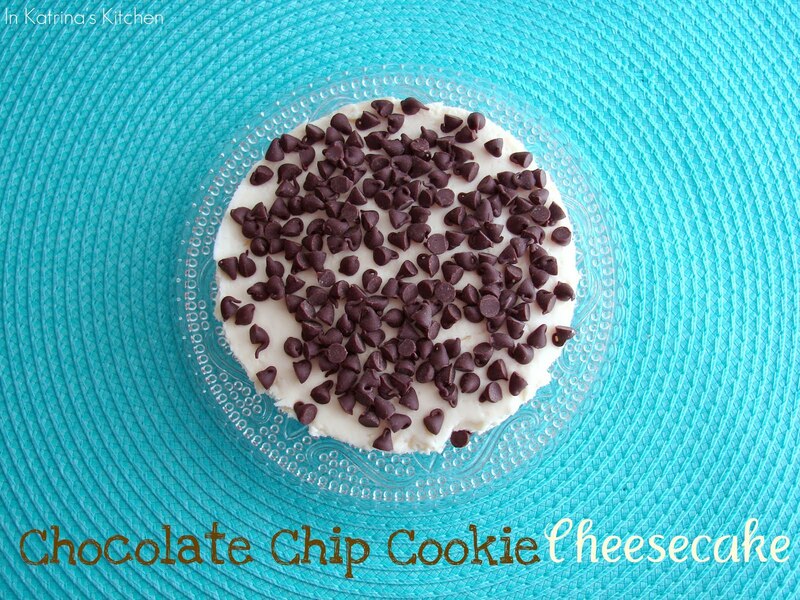 I love how think the crust is and that super yummy layer of chocolate chips on top…looks absolutely heavenly! How could the hubby not love this mile high cheesecake? 😉 Looks wonderful and I love the mini size. I must shop for this smaller springform pan. Silly husbands! I’ve never seen this combo before, but it looks so good! Wow this looks incredible! How anyone could not love this is beyond me! So glad you did post it! I am a little late with National Chocolate Chip Cookie day – I am making mine today. Hopefully the holiday will forgive me! This looks wonderful! I love that they are little, and that they have a cookie crust!! Good work, yet again! I love the picture of the inside shot of the cheesecake. You can see all of its deliciousness! The chocolate chip crust looks yummy. I love celebrating food days, especially when it involves chocolate chip cookies. I am with you though, it is so hard to be update on them. This recipe looks amazing. I cannot believe it was an old post. I would have been itching to post this this second it was done. I want to eat it up. OH MY GOODNESS!!! Chocolate chip cookies are my favorite thing on the planet and cheesecake ranks very high up on this list also. This sounds amazing and so easy. I am going to try it very soon! My husband probably won’t be a big fan either, but like you, I am prepared to agree to disagree. Thank you so much for sharing! This cheesecake looks divine! I love the cookie crust. Holy crap! Amazing! I love this so much!! This may have to be the first thing I make when I get off my damn diet! Congrats on Top 9 Katrina!! Woohooo! This cake totally deserve to be there. I love it! That looks pretty darn yummy!! Bravo on top 9. 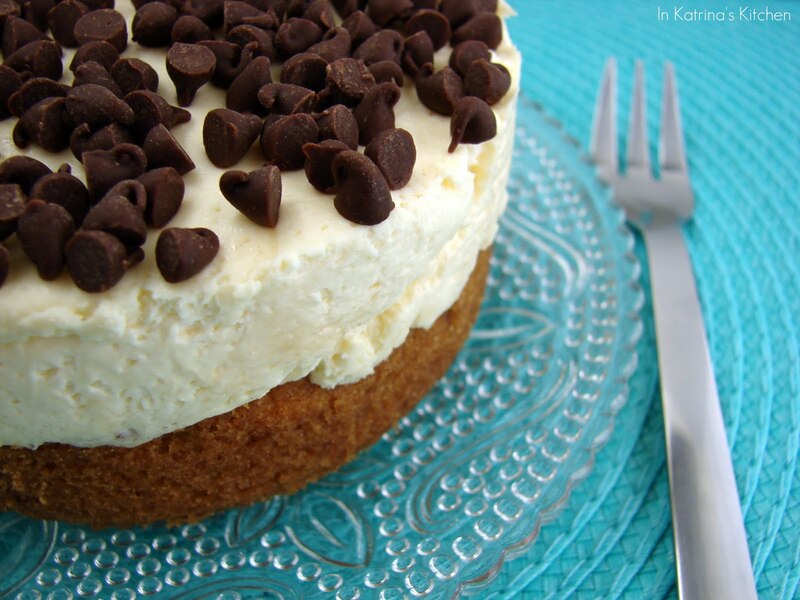 What an amazing cookie-cheesecake. I want hubby’s portion! National Chocolate Chip Cookie Day? Great fun. Seriously, my eyes rolled back in my head when I saw the picture with the chocolate drizzle. This looks so delicious!! I want to give it a try. It looks like the most incredible cheesecake I’ve ever seen! It would go down VERY well in my house. Congratulations, your Chocolate Chip Cheesecake made this week’s top hits @ singingwithbirds.com. Thanks for sharing such a terrific treat with all of us! Easy and yet delicious!! I already saved this recipe in my favorite list. Thanks for sharing! Oh my holy crud! I need this. No, let me rephrase that. I NEED this!!!! Looks amazing!!!! OMG! That looks SOOOOO amazing!!!! Thanks for sharing!!! Adorable and absolutely fantastic! I didn’t even know they made mini springform pans. Awesome idea! What a great blog. Thanks for sharing all your yummy recipes! Cheesecakes like these make me happy. I’ll take chocolate over fruit every day 🙂 Yum! I’m adding this to our wedding cheesecake list – many thanks for a great idea! Oh, yum, yum! Wasn’t this a Top 9 the other day? My gosh, if it was, I didn’t even realize it was yours, sorry! What a great cheesecake idea. MMM!!! My daughter would be all over these… and she could whip them up herself!!! Well done!! I’m afraid I’d have to purchase double the chocolate chips though as she seems to have a habit of eating them while baking then we run out!! Oh good Lord…. That is one HUGE and AMAZING cheesecake… Totally saving this one for my Father In Laws birthday this year as he loves cheesecake! this looks so good! Decadent and rich and all the above! MMMM..this looks amazing! Can’t wait to try it!! i really don know why your husband didn like it…we’re dying one by one here looking at it fron an overdose of inhaled CO2!!!! i’ve been adding recipes to my new recipe organizer (am doing a post on it). hope you don mind me adding your image, if it is supported, along with the recipe. i keep it public so tht foodies across can glimpse! I think I only need to visit your blog everytime I want to look for gorgeous and absolutely mouthwatering dessert, just look at this one…! Total yumminess, I wish I could have it right now…! Wow! Cheesecake is perfect! Like the easy recipe. This looks amazing – I can’t wait to try it! my hubby is the same way, loves fruit treat!! but me..oh no more chocolate please!! I love the third pic, delish! This looks awesome! I love the drizzled chocolate, and the crust looks delicious. I think this is the most mouth wateringly delicious cheesecake I have ever seen! Ciao ^_^ lieta di conoscerti, questa cheesecake è una visione paradisiaca, bravissima! hi what do you mean by separating the choc chip crust dough into 6 portions???? So you don’t actually just push it into the spring pan? Wow! Cheesecake and fuit, cheesecake and candy, cheesecake and cookies…it all works for me! Looks delicious! Thanks!! oohhh my!! yes please! i sooo wish i had one of these to go with my coffee RIGHT NOW!! This looks amazing! Can’t wait to try it. I am sure my husband will disagree with yours, he LOVES chocolate on anything! Thanks for sharing! This sounds divine, I am for sure going to give this one a go! Wow! I’m so excited to make this. I don’t have mini-springform pans. Would this whole recipe even fit into one regular size springform pan?? As I type this, my cream cheese is almost at room temp, and the cookie is baking in the oven, in the springform. Slight modification on my part, though — i’m using a wonderful key lime cookie dough i found, which i added white chocolate chips to. I will put the cheesecake on top of that, and top it with a white chocolate ganache. Can’t wait to see how this comes out!!!! thanks for the recipe! How far in advance do you think I could make these? I’m thinking of making them in tiny mason jars for my son’s bday on Saturday. I just don’t want them to get icky or soggy…and I’m no sure how firm the filling layer is… Looks so delicious! I wouldn’t do it more than a day in advance. You just don’t want the filling to collapse. Have a great party! This looks like a great recipe!! Would cutting the recipe in half work alright? I haven’t personally tried cutting this recipe in half. Oh my gosh I use to use this cheese cake recipe all the time but misplaced it and have been looking for it forever ! I seen this on Pinterest and it looks soo yummy I am making this tomorrow !! Thank you for sharing it with us !! This cake was reaaaalllyyyy sweet, too sweet for me but my bf loved it. I think it would be great paired with fresh fruit. hola, soi iara de Argentina! se ven muy interesantes tus resetas me gustaria saber si podes publicarlas tambien en español. muchas gracias!!! Can this be made in any other type of pan? Some others have made it in a 9 inch springform pan that I know of. Can I use one 9″ cheesecake pan instead? I don’t have mini ones!!! Others have commented that they made it this way. You will have to adjust the baking time to ensure that the cookie base is baked through. Good luck! Thanks for stopping by! Can you make these in a muffin pan? I don’t see why not. I would use liners, or just be sure you are able to get them out of the pan.